Radiologists have adapted to countless advances in imaging technology in the past few decades. As the conversation turns to how to use data—from imaging technology or otherwise—via a greater push for data mobility and analytics, the question often asked is, "Where does interoperability fit in?" Radiology has made some progress in this regard, but that doesn't mean there's not more work to be done—or that many radiology providers aren't still experiencing hurdles in their attempts to manage or share patient data. 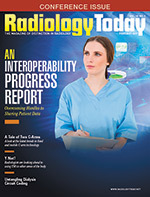 According to G. Philip Reger, chief technology officer for California-based Radiology Partners, interoperability has been fundamental to the success technology has had in revolutionizing the delivery of radiology services. "Interoperability standards, particularly DICOM and HL7 [Health Level Seven International], laid a fertile substrate from which PACS, voice recognition, worklists, EMR, CAD [computer-aided detection], and more could flourish," he says. "The enabling effect that it has had on systems like these means that we can give it significant credit for the astronomical productivity and clinical efficiency gains that have characterized radiology in the postfilm era," he continues. "For example, patients get their exams read faster. [Also], self-edit and template-based reporting can lead to more consistency and fewer errors." From a private practice radiology perspective, Reger says interoperability has also made new business and practice models possible. A prime example is off-site nighthawk radiology coverage. Such technologies can benefit hospitals as well, Reger says. "As radiology practices grow and become more technologically enabled, hospitals have a bigger pool of best-in-class radiology practices to choose to work with," he says. "A rural hospital three hours outside of any major metropolitan area is no longer constrained by the paucity of local radiologists. And a large, best-in-class radiology practice can now afford to provide access to highly trained subspecialists to those markets." So far, Reger believes the greatest value delivered by interoperability, as well as data mobility and analytics, can be seen mostly in radiologists' productivity and teleradiology domains. Even so, he says the value that current levels of interoperability have delivered makes the barriers that still exist hard to accept. For example, "there are very few who are using these technologies that have managed to quantify and show true clinical quality gains," he says, noting investment costs play into this but that value-based care models may push the issue. "As private practice radiology groups begin to feel the shifts toward value-based care, they will direct more of their investments toward technologies that deliver better outcomes," Reger says. "Since mobility and analytics are important tools for doing that, we should see an acceleration of new technical capability in those areas over time." Marwan Baya, CEO of Secant Healthcare, agrees. "Interoperability has become more critical, especially in this world as we start the move to merit-based incentives payments," Baya says. "Patients must have downstream access to their patient records with defined performance, period. Performance- or value-based care cannot be achieved through electronic silos." Baya says the vendor neutral archive (VNA) is becoming key, due to the possibilities that become available for analyzing large volumes of data. "Before VNA, most sites only accessed their long-term archive in the event of an outage or disaster," he says, noting that he's yet to see health systems implement them as they should—or could—by working within the VNA workflow and implementing Cross-Enterprise Document Sharing or image lifecycle management. Martin Kappeyne, a senior advisor at Impact Advisors and an imaging information systems consultant, says interoperability is an absolute requirement if the field wishes to progress. "Unfortunately, the standards to achieve this are all too often slowed to a crawl by the process of establishing a baseline and improvement cycles," he says. Still, improvements have been made. "No longer does every medical image need to be forced into DICOM," he says. "VNA is providing architectures that make it much easier to capture needed metadata for tagging images, and a number of entrepreneurial sites have sprung up to facilitate image exchange. The net result is that organizations can now agree to use a fairly simple method for making images visible or downloadable." It's a simple equation, says Michael W. Langenberg, CPA, executive director of University Radiology, which is based in Knoxville, Tennessee. The easier patient data can be shared, the better patient care can be. "Interoperability is a must for health care providers to efficiently and effectively take care of patients," he says. While Langenberg says radiology has made interoperability gains, they've lagged behind other advances in imaging technology. "This isn't to say that there haven't been advances in interoperability but, from my perspective, the practical day-to-day use of interoperability isn't integrated into radiology workflow as it should be." The implications of suboptimal interoperability? Higher cost inefficiencies, for starters. But it's also an enormous opportunity, Langenberg says, "for those who can make true interoperability a reality in their workflow." Most common data-sharing hurdles tend to revolve around interoperability, workflow, and compliance. One big challenge, according to Reger, is that data silos often isolate data. "Patient data silos and imaging silos limit the ability for radiologists and other physicians to form care teams that work together to meet the needs of each individual patient, especially over time," Reger says. "These silos also interfere with the ability for physician practices, including radiology practices, to exercise population health management and increase the level of care across entire communities." Reger believes incentives and/or protections could spur hospitals to push past this obstacle and "open their PHI [protected health information] and image repositories to specialists, like radiology practices. And private practice radiology groups need to prove that they can be trusted stewards of patient data." According to Langenberg, another common barrier, one which can affect patient care, lies in the difficulty in accessing pertinent clinical history and information that could help in the diagnosis and treatment of patients—particularly those patients presenting to the hospital or imaging site from other providers that are not part of the delivery system. He believes the answer may lie in the development and buildout of more integrated health information exchanges as well as "the related interfacing necessary to make that information available across multiple delivery systems and software/hardware platforms." Another data sharing challenge is getting radiologists' reports to referring clinicians and their EMR systems without issue. Standardization may be the key to solving this roadblock, Langenberg says, specifically the "standardization of interfacing with disparate EMR systems that allow radiologists' reports to flow seamlessly into referring clinicians' systems. Similarly, systems are needed that make sure radiologists and referring clinicians are notified when critical results or findings are acted upon." Agreed-upon standards and cooperation among health care providers could solve myriad interoperability issues, Kappeyne says. Two common issues he sees today revolve around data sharing when more than one vendor product is involved. For example, if vendor A's solution does not work with vendor B's solution, Kappeyne recommends developing a protocol that does not rely on DICOM. Another scenario he sees too often: "When organization A has purchased brand X and organization B has purchased brand Y, to share [data] they often have to agree on which system to use and how to share the costs," Kappeyne says. To solve this, he suggests integrating a simple charging solution so the requester can automatically purchase the images, thus subsidizing the operation of the service. Interoperability obstacles can also impede the application or development of other technologies, such as analytics, that would be useful to radiologists. According to Reger, this may change soon if market forces have any say in it. "As technology vendors anticipate that radiology practices will be looking to invest in analytics technologies that enable them to deliver and show value, more and more, new point solutions will be available on the market, ie, more CAD, AI [artificial intelligence]-based virtual residents, radiomics-based predictive diagnostic tools, and more," he says. Also, Reger notes that any radiologist will tell you there's no easy way—if it's possible at all—for these tools to interoperate with the core tools used by nearly every radiologist practicing today, such as PACS and voice recognition. "Since there is a finite number of tools a radiologist can be expected to interact with before productivity and quality collapses, there is currently a limit on how many of these new technologies can be used, no matter how valuable each may be in isolation," he says. The solution? Moving forward, Reger hopes technology vendors will learn to spend as much time on designing usable application program interfaces as they do on user-facing aspects of their systems. "Additionally, they need to figure out how to make the data sets that they create available to integrate with other tools," he says. Compliance concerns can also factor into interoperability issues—and not in a good way. "HIPAA and other rules have created large disincentives to sharing PHI across medical practice entities," Reger says, noting that any gains achieved through meaningful use have been limited to interoperability that exists within the walls of individual institutions. "The costs of implementing a practical HIPAA and InfoSec program are higher than they need to be because regulations have not always kept pace with innovations in security technologies and best practice approaches." Simpler rules, as well as "practical cookbooks that can be used to achieve meaningful levels of security that are easy for everyone to understand and agree to" would go a long way to getting around this roadblock, he says. "Disincentives to sharing need to be more balanced in light of the important role that information sharing has to play in reaching new levels of clinical quality and value." Taking a wider lens, what's even more concerning to Reger is that strict HIPAA rules may be so costly and the financial consequences of a breach so high that it may dissuade well-meaning or cutting-edge service providers from even offering their services to health care institutions. "This means that the rate of innovation is limited by the conflicting incentives facing health care providers," he says. "[We need to] find new ways, perhaps via new Safe Harbor rules, to make it possible for cutting-edge providers of technologies to work with patient data in a way that is still sensitive to privacy and compliance," Reger says. Lengthy and strict regulations not only dissuade potential technology vendors from entering the health care space but also dissuade health care networks from sharing patient data among themselves, Langenberg says, "under the name of compliance and network security." In an age that requires and demands more interoperability—not less—Langenberg implores providers "to embrace the value creation of true interoperability among providers and trust, as much as can be, the network security and the health information protection that must be built into the process. For hospitals or health care providers to completely close their networks from receiving pertinent clinical information or sending pertinent clinical information to other networks is counter to where health care is going." A wholly interoperable health care system is an ambitious task, no doubt. But when patient care can be impacted by how hospital networks manage patient data, either within their network or with subspecialty partners, it's an important goal. "The more clients we get and lives we touch, the more we see situations where silos of imaging data adversely impact patient care," Reger says. "Just yesterday, we finished integrating our RP Cloud system (PACS, worklist, voice rec, analytics) with a client whom we had previously been reading for but using their client-provided system. Almost immediately, we started identifying relevant prior exams for patients that had received treatment at one of the outpatient imaging centers we service across town. Our radiologists would have never known that these priors existed, and in some cases these priors can have an impact on the overall quality of the diagnosis provided by the radiologist." Langenberg offers another example: "Our group works with different partners, some of which are further along the path of interoperability than others. Those who embrace the sharing of patient information in a more seamless manner are able to make radiology care much more efficient for the radiologist and the patient. For example, sites that we have interoperability agreements with are able to load comparison images from outside imaging sites for our patients as well as prior radiology reports. This makes the patient experience easier because they do not have to deal with getting images burned to disc and having to determine where to send that disc to have it loaded into the PACS system. Or, worse yet, sometimes these images are just not made available, which can result in repeat imaging studies." Secure image sharing adoption that includes mobile devices in particular is important, Baya says—and it goes beyond sharing among health networks. "I have personally seen the junior interventional radiologist on call take a picture of the key images of an exam with his cell phone and text those images to the senior interventional radiologist for a consult prior to a procedure," he says. "At that time, the physicians did what they felt they had to do to properly care for their patient. Now they can securely share those images and the senior radiologist can retrieve the images on most any mobile device—particularly on tablets that now have near-full diagnostic display capability." Setting up a smooth data process flow may not be easy, but those interviewed here insist it's possible and a task worth tackling until it's done right. Reger's best advice to ensure that result is to get the right people on board. "You need to partner with people at your client sites who will benefit most directly from what data and workflow can provide," he says. "For instance, imaging department heads are getting pressured to deliver more reads by subspecialists. Can you use data to deliver that? They care about department throughput as well. Can you help them make this process faster? "Another place to go is clinical quality directors and staff who are focused on driving quality initiatives," Reger continues. "These individuals appreciate the relationship between smart data and better outcomes. We had a hospital client that wanted help identifying patients who had certain types of radiology findings at the point of discharge. We were able to give their discharge planners access to one of our data mining tools so they could search for these patients and reports themselves. Once they started doing that, they became an advocate for more interoperability with the hospital administration." "Bring all the parties together, follow lean principles, have a leader who understands how to analyze and restructure workflows, ensure that upper management is committed to the process, and stay at it until [workflow is] implemented and tested," Kappeyne says. Keep at it. Then keep at it some more, Langenberg says: "The best advice is to make sure that the radiologists have all of the information they need to provide excellent clinical service and it is delivered to them in an efficient manner. Do not be willing to compromise until this is the case."